All Apple computers ship with iMovie software installed. The video clips in your Photos albums are available to iMovie automatically. You can also import media from your iPad, iPhone, or iPod touch, from file-based cameras, and from tape-based cameras. You can even record video directly into iMovie. Whichever method you use, after you import video into iMovie, take the time to clean up and organize the different clips. This keeps your project orderly and makes it easier to find what you are looking for. 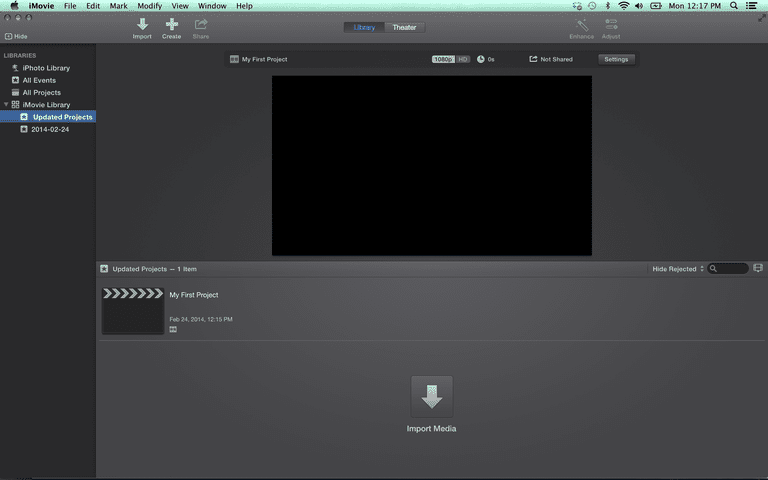 You need to create a project and import video clips before you can start working on your iMovie project. Click the Project tab at the top of the screen. Click the blank thumbnail image labeled Create New and select Movie from the pop-up. The new project screen is given a default name. Click Projects at the top of the screen and enter a project name in the pop-up field. Select File on the menu bar and click Import Media. To import a video clip from your Photos library, click Photos Library in the left panel of iMovie. Select the album that contains videos from the drop-down menu at the top of the screen to bring up thumbnails of the video clips. Click on a video clip thumbnail and drag it to the timeline, which is the workspace at the bottom of the screen. If the video you want to use isn't in your Photos application, click the name of your computer or other location in the left panel of iMovies and locate the video clip on your desktop, in your home folder, or elsewhere on your computer. Highlight it and click Import Selected. Repeat the process with any additional video clips you plan to use in your iMovie project. Drag the clip you want to split into the iMovie timeline and select it by clicking on it. Use your mouse to move the playhead to the first frame of a new scene and Click to position it. Click Modify the main menu bar and choose Split Clip or use the keyboard shortcut Command + B to split the original clip into two separate scenes. If you won't be using one of the clips, click it to select it and click Delete on the keyboard. If some of your video footage is shaky, out of focus, or unusable for some other reason, it's best to trash this footage so that it doesn’t clutter up your project and take up storage space. You can remove unusable footage from usable footage in two ways: split it or crop it. Both methods are non-destructible editing; the original media files are not affected. If the unusable footage is at the beginning or end of a clip, just split that section off and delete it. This is the best way to go when the part that you don’t want to use is located at the beginning or end of a clip. If you want to use a piece of video that is in the middle of a longer clip, you can use an iMovie shortcut. Hold down the R key while dragging across the frames you want to keep. The selection is identified by a yellow frame. Choose Trim Selection from the shortcut menu. NOTE: Any video that is deleted through either of the methods outlined in this step disappears from iMovie for good, but not from the original file. It does not show up in the trash bin, and if you decide later that you want to use it, you must reimport it to the project. If you add clips to your project and decide later you don't want to use them, just select the clips you want to get rid of and click the Delete key. This removes the clips from iMovie, but it doesn't affect the original media files; they are retrievable later if you decide you need them. Now, your project should only consist of the clips that you are planning to use. Because your clips are cleaned up and organized, it’s much easier to put them in order, add still photos, add transitions, and create your video project. How do You Use Effects and Transitions in iMovie Projects? Do More With Your Video - Advanced Editing in iMovie 10!